We're a mapmaking company working out of Central Oregon with a focus on specialty regional atlases. By blending high-interest, hard-to-get feature layers with our exquisite set of topographic and satellite base images, we're working hard to provide our customers an unmatched array of high-quality atlas products; at the best scale available in an atlas. We offer full coverage of the Lower 48 United States, Alaska, Hawaii, Provincial Canada and the Northwest Territories. 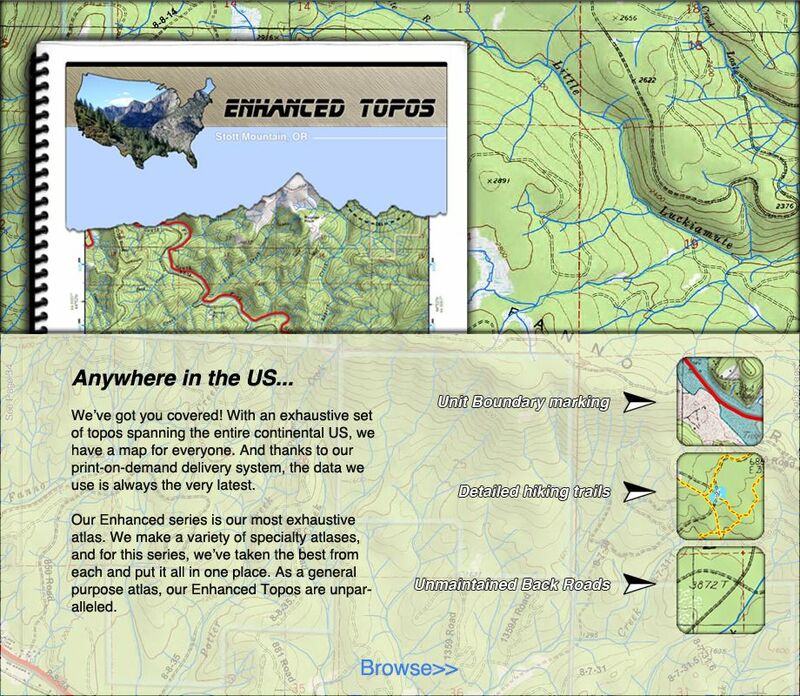 26,305 11"x17" 3D Shaded Topo, Aerial, or Facing Page Atlases available in paper or geospatial PDF eAtlas formats. 1,083,954 11"x17" 3D Shaded Topo or Color Aerial Single Pages online and availble in paper or geospatial PDF eAtlas formats.